Bracketing is the process of taking three photos; one using the camera’s recommended settings, one intentionally underexposed, and one intentionally overexposed. The reason is simply to be sure you can get a good exposure from a subject that’s hard to meter. 1Switch to a shooting mode that supports auto exposure bracketing. 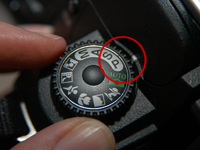 With most digital cameras, you can bracket exposures when shooting in P, Aperture Priority (AV or A), or Shutter Priority (Tv or S) mode. This figure shows a camera in P mode. 2Access your camera menu and navigate to the section for bracketing exposures. Each camera manufacturer uses different menu settings. Refer to your camera manual for detailed instructions on how to bracket exposures. 3Specify the amount by which each shot will be overexposed and underexposed. Most camera manufacturers enable you to change the exposure compensation by –2 to +2 EV (exposure value), in 1/3-step increments. Typically, you use a dial or a multifunction button to increase and decrease values. When you take a photograph using auto exposure bracketing, the camera captures three images at different exposures. 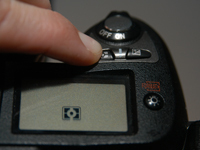 Most cameras take the photos in this sequence: standard exposure, underexposed, and overexposed.